I love to have a stack of fun free home school printables ready for a rainy day - or to take with me on train journeys. It is also good to be prepared for those times when you just have to wait - at the doctor's office or in a restaurant. Print out a stack and keep a few in separate folders ready to grab when you are heading out of the door. Or of course, don't forget you can also use them for strewing around the house or in your boredom buster kits. It is a perfect way to fit in a little sneaky homeschooling! I try to pick printables that are not overly educationally based. I want a little excited learning - not for the children to just be bored. We do do worksheets occasionally - but this list is more for the fun times. Kids Quiz. 60 quiz questions and answers aimed at kids. We used this to make a Kids Quiz Jar. This is a great site for free hidden picture puzzles - you know - the sort you have to hunt around the picture to find the hidden items! They have printable hidden pictures, or you can play online. You can find them at HighlightsKids. The rest of the site is worth a look too - I liked their science in action section! Even older children can enjoy coloring pages. The Coloring Castle have some nice Mandala pictures - with other nice pages in a menu on the right hand side. Visit Busy Bee Kids Printables for fun, FREE kids printables! You'll find coloring pages, word searches, mazes, dot to dots and so much more! Suitable for preschoolers on up! As well as taking home-made notebooks, what about printing out some comic strip blanks. These should really inspire the children. This site also has some nice story sheets if your children like to write their own stories. There are a lot of printables at this site, or here. You can even make your own Wordsearch based on words or spellings you want the children to learn. There are lots of different types of number puzzles that kids enjoy. Try Sudoku, or Kakuro. I haven't found it easy to find good Spot the Difference puzzles. My children love to draw, but 'How to Draw' instructions often encourage them to try something new. How to draw a Webkinz Pet has instructions for some cartoon-type animals. It is worth searching the web for step-by-step instructions of things your children would enjoy, such as this Stinkbug! Dover publications have a weekly sampler that is worth signing up for. Each week, Dover will send you some links to free pages of their books for you to download and print. 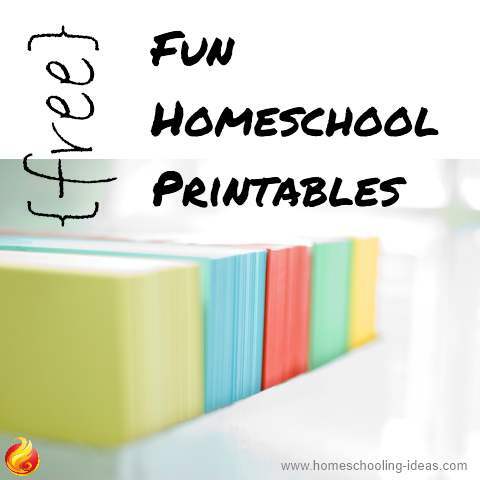 A great way to get some interesting and unusual free home school printables. Printable toys take a little more effort to use on road trips, because you have to remember scissors and glue! But here are some ideas you may enjoy. Readymech have some nice Flatpack toys that we enjoyed making. Whilst searching for something entirely different, I happened upon a great site . Its called The Toymaker and it has lots of printable paper toys to make. I think the Wind Boats look great fun, and I think my boy would like Florimel the Magnificent. Definitely a site to keep up your sleeve for a rainy day!! And did I find what I was looking for? Yep! This paper doll site. And just so you know -under ’Adult Printable Paper Dolls’ is a link to paper dolls of The Six Wives of Henry VIII. My kids said I should post this next link, as they have had so much fun with it. PaperCars.net provides printouts of several types of cars (click on 'The Cars' get started) that you can cut out and glue (we used tape!). Some of them are trickier than others - the VW Bus is a good one to start with. And the end results are pretty good! I hope this Free Home School Printables page has given you some ideas that your children may enjoy! Have fun!